If you are learning how to make Italian cream puffs, there are many version like or similar in different parts of the world like France and Greece. In Italian these “bocconcini con cremas” are a favorite food for important parties and weddings. Like the cannoli, there is a base for making Italian cream puffs and the base is the most important part. 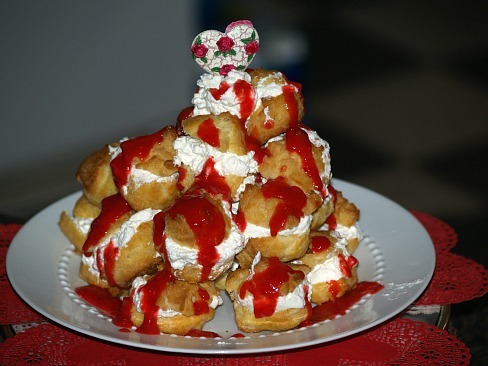 This base is a puff pastry recipe called “choux pastry”. Choux pastry is a very simple and basic recipe consisting of 5 or 6 ingredients. The sixth ingredient being the addition of a little sugar if desired. The sugar is not necessary but some prefer it when filling with custards or even gelato. These pastries can also be filled with a variety of other fillings like seafood salad etc. The pastry can also be made into different shapes reflecting the occasion for which it is being served. The history of puff pastry is quite interesting. A chef from Florence in the 1500’s came up with the recipe to make a gateau recipe. Later someone picked up the idea to make small cakes shaped like women’s breast. In the eighteenth century someone created buns with the pastry and the name was changed to “choux” buns. Since the 18th century, from time to time since then the recipe has been modified to what we have today. I have a lot of sources for this recipe and all of them are the same. I am giving you this recipe; I have used it to make hundreds of the puffs for weddings. They are easy to make and after cooling you can put them in a plastic bag and freeze until ready to fill. This is very convenient for planning for parties and weddings. 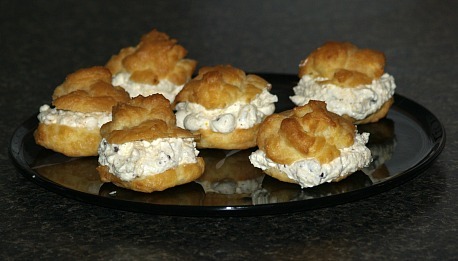 As I learned how to make Italian cream puffs, lies in the many different recipes for fillings. Although I do like the puff pastry recipe filled with various salads, my favorites are the many sweet creams. In Italy the fresh locally produced cream, butter and eggs add to the wonderful flavor. Many of these sweet cream recipes like the Italian cheesecakes contain ricotta cheese, which makes them very special. In saucepan heat water, butter and salt to a full boil. Reduce heat and quickly stir in the flour, mixing vigorously with wooden spoon until mixture leaves sides of pan and makes a ball. Remove from heat and beat in the eggs, one at a time, beating after each until mixture is smooth (electric mixer makes this easier). Drop dough from spoon onto a greased baking sheet. Bake for 25 minutes or until puffs are double in size, golden brown and firm to tough. Prick puffs with a fork or sharp knife to release steam. Leave puffs in the oven for another 5 minutes and then remove from oven and cool. Cut off tops and fill. 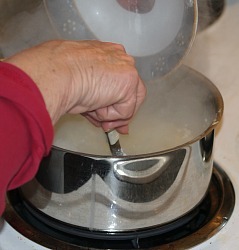 Scald cream in top of double boiler. Mix sugar, cornstarch and salt. Stir into cream. Cook, stirring until thick. Cover and cook 10 minutes longer. Add small amount of hot mixture to the eggs and return to mixture in double boiler. Cook for 5 minutes. Stir in butter and vanilla. Dump in a bowl and sprinkle a little sugar over top to prevent skin from forming. Chill and then fill puffs. Combine ricotta cheese, chocolate, orange and sugar. Blend well. Fold in whipped cream and vanilla. Chill well and fill puffs. Grease and lightly flour baking sheet; trace a 7 inch circle using a plate as guide. 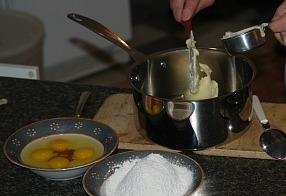 Drop heaping tablespoons pastry around the outside of marked circle to form a ring. Bake 40 minutes or until golden brown and firm. Turn off oven and leaven in oven for 15 minutes; cool completely. With sharp knife cut in half horizontally; with spoon remove soft interior leaving hollow ring. To serve prepare favorite filling, fill shell and replace top; RIGHT BEFORE SERVING. The “swans” are a favorite shape for weddings and parties. Preheat oven to 375F degrees; grease a large baking sheet. Spoon ¾ cup choux pastry dough in pastry bag with 1/8 inch round pastry tip. Pipe onto baking tray (36) 2 inches long “question marks” for swan’s necks making a small dollop at the end for each head. 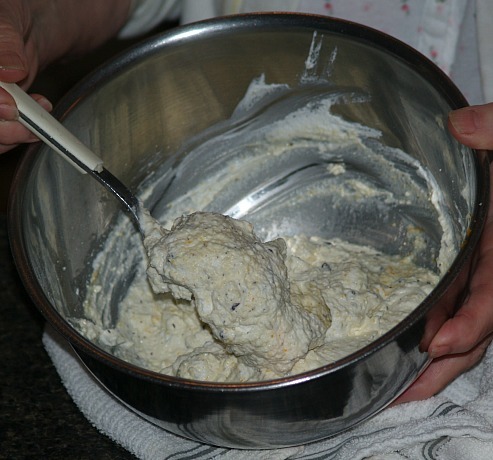 Spoon remaining pastry dough into large pastry bag with ½ inch round tip. Pipe onto tray (36) 1 ½ inch by 1 inch teardrops for the swans bodies about 1 inch apart. Bake 10 minutes or until necks are golden; remove to rack to cool. Continue baking bodies 20 to 25 minutes longer until golden; remove to wire rack to cool. Cut off top third of swans bodies; set aside. Spoon filling into pastry bag with large fluted tube. Pipe some filling into bottom pieces. Cut top pieces of swan’s bodies lengthwise in half; set into filling for wings. Place head and neck pieces (the question marks) in filling and chill. 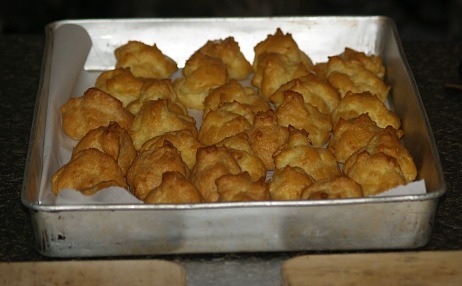 Cut off tops of baked puffs and scoop out centers. In a large bowl combine ricotta, sugar, rum and spices; beat until smooth and creamy. 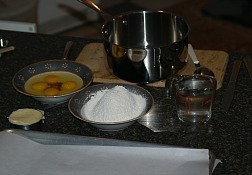 Stir in well drained pineapple; spoon mixture into puff shells and replace tops. Dust puffs with sifted powdered sugar. Prepare pudding mix as directed on package using 1 ½ cups milk. Turn into medium bowl and cool completely. 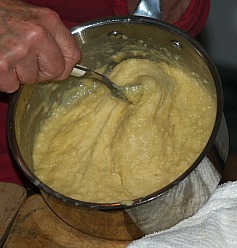 Add sour cream and extracts; mix with rotary mixer until smooth. Cut baked puffs in half and remove any soft dough inside; reserve tops. Drain oranges and discard liquid; pat dry with paper towels and arrange in bottom of puffs. Beat cream until soft peaks form; add liqueur and 4 tablespoons powdered sugar. Beat cream until stiff and pipe into cream puffs over top of oranges. Replace tops and dust with powdered sugar. 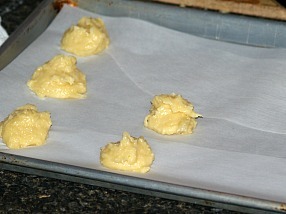 Cut baked cream puffs in half horizontally; remove tops and any soft dough inside. Place 2/3 raspberries in bowl and sprinkle with granulated sugar; toss gently. Spoon berries into bottom of puff shells; puree remaining berries in blender. Beat cream to soft peaks; add reserved raspberry puree and 4 tablespoons powdered sugar. Beat mixture until firm; pipe whipped cream over top of raspberries in shells. Replace tops and dust with powdered sugar; refrigerate until serving.